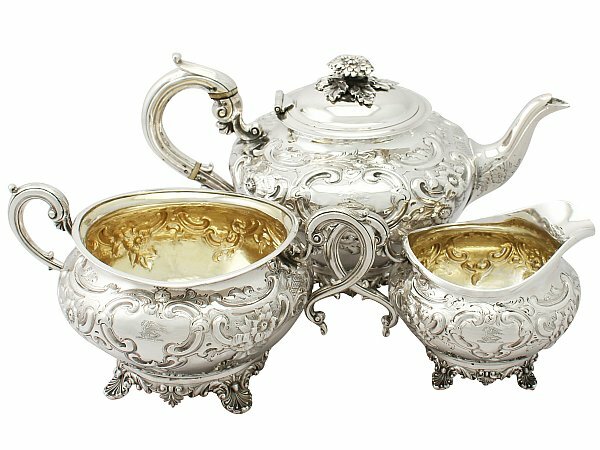 This exceptional antique George III three piece sterling silver tea service consists of a teapot, cream jug, and sugar bowl. Each piece of this impressive set has a circular rounded form onto four bracket style feet. The body of each piece is embellished with chased scroll and floral ornamentation accented with panels of trellis decoration. The decoration to each Georgian piece incorporates a shaped scroll bordered cartouche to either side, one remains vacant and the other displays a contemporary bright cut engraved crest of a pelican in her piety, wings addorsed and elevated. The teapot is fitted with a plain domed hinged hallmarked cover surmounted with the original and impressive stemmed floral and foliate decorated finial. The teapot, cream jug and sugar bowl are fitted with S scroll handles with scrolling leaf decorated thumbpieces and a bifurcating lower scrolling terminal. The teapot is fitted with a plain swan necked spout ornamented with further floral and leaf decoration to the lower portion. Each component of this service is supported by four Regency style bracket feet ornamented with scroll and leaf motifs. The cream jug and sugar bowl retain the original gilded interiors. This antique sterling silver tea service is a very good gauge of silver, excellent quality and in excellent condition. Full hallmarks struck to the underside of each piece and part hallmarks struck to the cover of the teapot are all clear, in keeping with age. Reflections in photographs may detract from the true representation of these pieces of Georgian teaware. Length from back of handle to tip of spout 28.5cm/11.2"
Length from back of handle to tip of lip 15.7cm/6.2"